Just got done with watching the first installment of TUC the Lighter Side of Life with Mahira Khan, our homegrown version of Koffee with Karan, and have to say I walked away very entertained – I know I’ll be tuning in every week! I had never seen her host before, but after watching this episode I thought Mahira was a good choice for this kind of a lighthearted show. 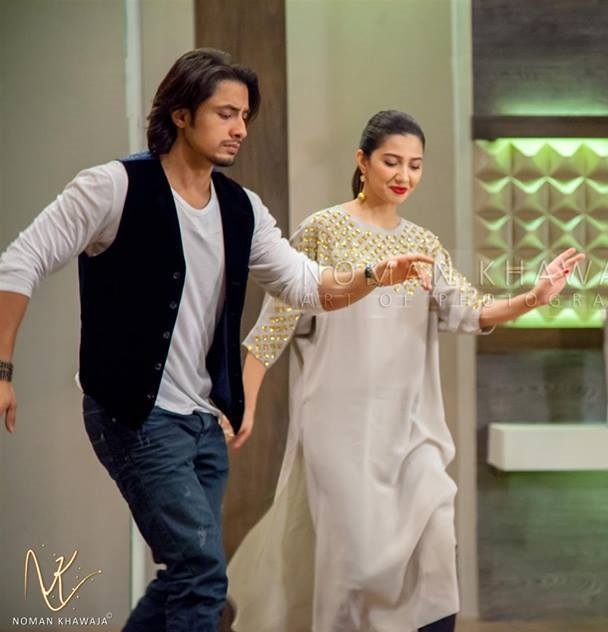 Though she is THE Mahira Khan, I appreciated that she was able to put aside her own celebrity and allow for the spotlight to be trained on her guest, Ali Zafar in this case. Her gentle probing allowed for Ali Zafar’s innate charm and wit shine to through brilliantly. I’m not quite sure as to how scripted the show was, but I enjoyed their aiwaein shooting the breeze kind of repartee; made me think of the every day nonsense chats we enjoy with our friends, except I do not know how many of us have a sit down with a Mahira or an Ali Zafar on a regular basis. The little sing song was sweet, but for me the best moment of the episode was Ali and Mahira’s impromptu dance bit – loved it! Mahira! Bas, ab bohot ho gaya, we need you back on our TV screens! While we wait for Mahira Khan the actress to make a comeback, I enjoyed watching this vibrant, glamorous host Mahira – thank the lord she decided to stick with her signature elegant style and not go the Christmas tree route. The host’s elegance was carried over in the clean lines of the set design as well. Given that this was a sponsored show I was leery of being hit over the head with sponsorship banners and logos, but thankfully the directors and producers were able to strike a happy balance and the advertising element was incorporated within the set design in as unobtrusive way as possible. While there were a lot of pros, the show had its fair share of cons as well. We saw stilted segueways, a not so happening turki-ba-turki session, and quite a few what do I do/say now moments from Mahira. I am hoping, however, that most of these issues will get sorted out over time as the show finds it footing. For now I thought this was a good opening chapter and offered a welcome break from the mind numbing chatter of our morning shows and the distasteful mudslinging seen in the evening political talk shows.So yeah, give or take a few issues, I enjoyed this episode and am now looking forward to the next installment. Did you guys get a chance to catch this opening episode? What did you all think? Hey! Busy weekend!! Keep surprising us yaar! Waiting for sannata we get MSKSH and waiting for numm we get tuc… 3 reviews in a day and 4th on its way… Girl u got some himmat yaar!! Mashallah mashallah Lolol.. Keep the good stuff coming! Watched it. Loved it! Im not a morning show type but this was good fun! Dance was good fun.. And our MK was better than AZ! She was in her element there! Enjoyed the lighthearted gup shup.. Loved ur ainwein! Yes MK wanted u back on our screens badly! Haven’t caught up with Numm as yet .. hadn’t thought of doing this one but I enjoyed it so thought ke chalo dekhtey hain aap sab ko kaisa laga..
yes, MK looked fab and her tunic, Muse for those who are interested, and her sophisticated ponytailed look was lovely. You know the one thing I love about MK, and AZ commented on it as well, is her innocence, her girl next door aura (although mujhe aaj tak aisi koi parosan nahin mili hai! ) and I am so glad to see that the directors/producers have allowed her to be herself rather than put on an act and be formal and fake. What do you mean by “thank the lord she decided to stick with her signature elegant style and not go the Christmas tree route”? Could you please explain. @FA aap ki zara nawazi….what a compliment…FK aur main saath saath .lol. happy happy! If I were to pick a couple of things I did not necessarily enjoy was the on going girl talk and a bit OTT filmy interaction …. it was a fine balance between keeping it casual, honest and light hearted and this. i felt once or twice they went overboard but I would still prefer to watch this than anything else on the tv right now. While you got to see so much of Ali’s wit, humour and charm, a little bit more about him would have been nice. BUT i loved it….and can’t wait for FK’s to be aired! And yes, i was thrilled to hear his choices, ali azmat and FK. ( I love Atif Aslam also). I remember AZ saying on ZGH ‘s live show that in his view FK has so much potential and he is made for the big screen. You don’t get to hear that very often and it was very nice to hear that. I also recall someone commenting (maybe MD) on the show Ahsan Khan did on Humsafar that no one wanted to do the show maybe coz they were insecure after HS’s success. Yes girl talk did go a bit OTT at times.. I enjoyed the fact they were talking abt their bachchas .. Like we all end up doing with all our freinds..but they couldve picked a better topic there.. I mean talk abt setting bad example here haha i thought they did go ever board there..
Re MK haters: And im really surprised to hear abt MK haters… Really?? They have gotta be the jealous ,keep my husband away from her, types lolol otherwise who can hate her and esp not for going plastic…content-wise it did go overboard at times with the girl boy talk and i was wondering how it will be recieved.. But we do have all these cheap dramas with larka larki ko patana and all tou chalo why not have a few laughs here too..
Hello! Spot on Review! Enjoyed the show as well. Have always loved Mahira Khan’s style, from her tunics to her very vibrant red lipstick, Glad she went with her own style and not those decked out shalwar kameezes, (read: morning show hosts), like you said in your review. Ali Zafar looked really good. Loving his long hair, beard look. He seemed very laid back and chilled out with Mahira. Loved their dance bit. Was fun to watch. Boring at times, but def enjoyable. Especially compared to the lovely dramas currently on air. Aha will checkout MuSE now! But yes def enjoyed totally chill mahol! Catch up with Numm boss…Wont b disappointed! Any idea if they take online orders etc..
Btw where r they in pak? No mention on their website. No idea where in PK. I am sure Lahore/Khi. and yes love their stuff. Muse stock at Ensemble,PFDC lounge and 10 Q in Lahore-good stuff,my daughter got a printed silk jump suit in the summer -looked fab. HI SZ loved the review. Reminds me of Koffee with Karen . Was fun to watch. At list I have something to look forward to see something on Saturday because Last episod of Numm and I am going to Miss BS W and MJ .i was thinking what next after. Numm. LOL! It is funny isnt it, now that Numm is ending we will have to find something else which is fun to discuss and dissect … are you watching Shukk? Was like a breath of fresh air.Mahirah looked fabulous and immaculate-such a change from from the the shadi-mad chichoori/chichoora morning show hosts.Even the set was not bad,in fact classier than KJ’s latest tawdry do . Ali Zafar was great, laid-back and casual – unlike most of our mascarraed and lipsticked heroes.The line-up of guests looks promising as well.Saturdays are interesting again! I liked the show, it has a very soft feel and ofcourse Mahira’s glamour gives the show a good balance.. but i wasn’t completely impressed, as you mentioned there were lot of “what do I say now” moments. I liked AZ’s answers about FK, it’s great to see someone praising their rival/competitor. One thing which slightly irritated me was the constant “talk about girls” and AZ telling his 3 and half yr old son how to score with girls, was a bit too much. Having said that i am really looking forward to more episodes. Forgot to mention, I enjoyed their dance a lot..
Not being a pakistani, i have very limited idea abt ur celebs-the few i know are thru the pak dramas ive watched and some like ali zafar thru Indian movies. Read the review here and caught the episode coz i really like mahira. First things first-she was looking smashing!! Regarding the interview, I enjoyed it. Very light. Did i come away knowing more about Ali zafar-No! was that the intent-Maybe Not. There were definitely a few, i dont-know-what-to-do/ask-next moments and awkward pauses coz i guess, mahira still needs to find her rythym but overall it was a fun 40 mins. However, i have a diff question to ask here…WHy does mahira attract so much hatred??? I was reading the Fb page of dramasonline, the site where i catch all these shows, and was astonished to see the amount of criticism this show has attracted for being non-muslim in tone and content ( i wont touch that subject) but more so, Mahirah herself. Being called, behuda, shameless, a daag on society etc etc is too much. And then being described as pakora nose, cheap dresser! I for one like the fact the gal is fine with her pakora nose and untouched eyebrows and hasnt done cosmetic surgery at the first opportunity ( which is something i believe even the saintly FK has succumbed to). She is one elegant woman and has charm that crosses barriers..unlike a lot of the other actresses who dont have that international appeal-that “X” factor. Haha yaar there’s A HELL of criticism for Mahira on Facebook, and it even makes me wonder sometimes that how does the lady manage to gather so many votes on award shows when ostensibly she has so many haters. But you know I’ve noticed it’s usually the other actresses’ die-hard fans who are badmouthing her all the times. People don’t understand like you cannot draw comparisons between Mahira and sanam baloch just yet when the latter has done plenty of dramas and Mahira Khan just two! They both have their different places. Sanam Baloch is really good, I agree. But people don’t need to place her image on a pedestal by letting Mahira down. MK herself keeps on saying that she isn’t worthy of being called the best actress just now and that there are many better actresses. If she’s admitting it herself isn’t that enough?!? I for one really enjoyed the show, it was really fresh, despite, yes, being OTT at times. Looking forward to the rest. @indepgirl: Hey! Long time! I’m with you on that while this program will never help find the cure for cancer it can def provide entertainment LOL! Re: the question abt MK haters… I am just as perplexed as you are .. its not just now its been going on forever .. somehow she rubs people the wrong way I dont know why. I think Fizza, Mani, Rehmat all make valid points. I agree with Mani about Mk being equated with Khirad and people not accepting in her any other way.. I was never a Khirad fan so I dont get that part at all. But Falak I liked, infact loved, and I remember so much of this criticism even during SeZ time and I never quite understood even then…. After the controversy of the first episode it will be interesting to see the response to the second show and the series as a whole. Its Bushra Ansari on Saturday so there definitely wont be any flirting, lets see what ppl have to say abt that show! LOL! For all your complains abt Numm I am pretty sure you must not have missed a single ep so far 😉 Haan ji aap mithai tayar kar len … agle Sat ko party.. Numm ends and lets hope we don’t end having to read fatiha for dear departed Wali! Haan numm awards nahin bhoolna yaar!! BTW isko dekh ker mjhe Atif ka Interview yad aagaya jo MK ne VJ days main kia tha..aur woh isse 100 times ziada maze ka hai…kash inhone Atif ko bhi bolaya hota..
..toh aap ko irritation hogi but surely u gonna have fun..isko dekh kar hi main MK ki fan bani thi (Humsafar se kaafi pehle)…….aap agar poora daikhen toh bataiye ga porani MK aur aaj ki MK main koi fark hai ya nahi…mjhe toh lagta hai same hi hai buss ab thori calm ho gai hai pehle k mukable main…. Waslaam Aisha, How are you? @Rehmat: Haina! Mujhe bhi Falak ki bohot yaad ayee … remember the time when we all wanted her to have a garage sale for her clothes LOL! Like the others I was pleasantly surprised that you reviewed more than couple of dramas this week. I always look forward to reading your excellent reviews. In my opinion the hesitation seen on MK’s part at times should not be attributed to AZ since this was a scripted program and therefore there was no element of surprise. There has to be another reason for it. AZ’s responses were very smooth and not at all stilted – could it be that MK was not that well prepared and therefore AZ’s responses were throwing her off? The dance was done beautifully and both of them were in sync which makes me believe that they had spent some time together to practice it which should have put them at ease with each other had this been their first interview together, however this was not the case. Since MK had interviewed AZ prior to this one, she must have been aware of AZ’s flirtatious nature. Great review SZ, wouldn’t have known about this show if I hadn’t come across your blog. I also agree with many of the readers’ comments, specially Huma S’s. As far as criticism for Mahira goes, it’s beyond my understanding how anyone could be critical of her after seeing her work. People will criticize anyone. The world has acknowledged Malala, yet her own people have done a lot to malign her intentions, and she is a sixteen-year-old who took a bullet in the head. Do you think it’s hard for them to criticize MK? Sorry for the tangent, looking forward to watching this refreshing show. @Lara: Hey, Good to hear from you! Thanks for reading the review and following up on it and watching the show. Very well said about Malala … totally agree! @indepgal i so agree wid u…this is the case i too find.I sometimes visit some of the pakistani drama pages to knw more abt the celebrities and whenever u see a pic of mahira there i see so many comments scolding d gal for no reason simply calling aunty,vulgar n wat not..such cheap comments abt a lady.I just love MK the way she is..her bubbly nature.I just watched this show for MK… MK IS JUST WOWWWW. I am sorry for not joining in the discussions but I surely missed them terribly! Coming to TLSOL, I was thoroughly entertained by this launch episode. It was fun, entertaining and not once did I feel like getting a hold of my remote controller! A win win! @Heela: Hello hello ji! Baray dinon baad! Ab to waqai MK ka shukriya ada karna chahiye …this thread is sounding like a SeZ reunion 🙂 How’ve you been? hows parhai going? Glad to know you will be watching this one 🙂 Ab ghaib mat ho jana! Are you also watching Muhabbat subh Ka …? SZ, mazaydar show tha! Apart from a comment here and there- it was all good. MK is gorgeous and so ‘sweet’ that it’s just relaxing seeing her converse. AOA. Hats off to your consistency in keeping feet in two boats at all times. Rave review of program here but agreeing with all the rants that are being expressed on tweets. You are obviously trying to do damage control for all the hate you showered on Mahirah Khan in your reviews on Humsafar. As you have said so yourself on Twitter, you are now feeling bad about having done that. @ALL: Here’s a question for you all… do you think we should have a review for every ep. or should we do a biweekly double review? I’ll wait to hear your thoughts and take it from there….. Since this program is not a continuation of a drama but stand alone show with different guest each week, it makes more sense to do the review on a weekly basis. Moreover with the depressing winter months (more so after the holidays), your in-depth beautiful reviews and discussion forum thereafter are something very much to look forward to. If you have time then weekly review would be better because the guests will be different every week..
Promo of the second show looks fun …i like bushra ansari since i watched ghoonghat. Yes I think a weekly review will better too! With different guests I think we will get a very different flavour each week..
Bushra Ansari show seems like fun,. she always cracks me up! Mk looking lovey as usual but Im not so sure abt her sari this week tho.. poora dekhein ge tou pata chale ga! With Shukk, MSKSH and Tuc.. three reviews a week.. we are in for some great fun weekends ahead!! thanks @SZ! Keep the good stuff coming! .. mmmuuuaahh! Hey , this show was awsome! I loved it, specially mahira khan. Such a talented girl mashallah !! I am great, studies are coming along well too but very tiring. I never get time to sit in front of the Television screen that much but I have made an effort to catch up on sub ka Sitara and MK’s show…as they serve as flashbacks to 2011-2012’s Hum TV…a very,very positive change. I wish, I wish we see more of such great work on TV in the future and do not enter a phase of ‘NO QUALITY SHOWS’ 😀 iA! I had missed you all more, the discussions and the debates. MK Keliye tou Anna tha, and very true about the SeZ reunion! Yay! I will be trying my best to contribute to this thread and I promise not be M.I.A this time around 😀 looking forward to some great fun and entertainment! Let the show begin! Thank you for sharing your thoughts about this episode. You know, way back when Neeyat was airing, my biggest complaint about MK was her monotonous voice, so yeah totally agree with you on that criticism. But since then I think she has worked very hard and since Humsafar I have noticed a gradual improvement in this area. In any case glad to have you on board, and I hope we will hear more from you on the Shoaib Malik episode this week. And haan, since you found us via Numm, how come we haven’t heard fro you on that thread? Any last, lingering thoughts you want to share. Any comments on what the writer had to say about Numm? Your review was nice. I am a bit late but I want to say that this is not the homegrown version of Kofee with Karan. KWK is itself a huge copy. In the west, David Letterman and Craig shows are completely same but they are never told of copying. KWK do not have the copyright of such themed show and anyone who has such theme should not be blamed of copying. Enjoyed your comment and I get what you’re saying, and agree ke if you see it that way then there s nothing really “original” out there, everything is inspired from one thing or the other. That said, I think whereas KWK was “inspired” by David Letterman and other US talk shows, TUC did borrow a bit more heavily from KWK, … And on those lines, I don’t find HSY’s talk show anything extraordinary either .that one too is no more than a composite of a bunch of other popular talk shows ..
Would love to hear more from you on the other serials I am reviewing … are you watching any of those?